With 22 years of experience in the optical field, Stephanie comes to us from Las Vegas, NV. She moved to Keller, TX in 2016. With her outgoing and delightful personality, Stephanie has enjoyed people of all walks of life. 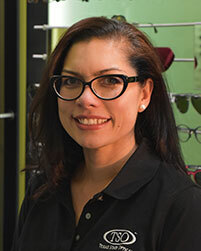 While working with patients to meet their eye care needs, she has also volunteered her time to the Lions Club Gift of Sight Program and Vision Van. When she is not working or volunteering, Stephanie enjoys drawing, painting, and dancing. She also loves spending time with her family, who mean the world to her.